Having very recently started getting interested in philosophy, I'm still halfway through my first book (Think: A Compelling Introduction to Philosophy, by Simon Blackburn, as recommended in this question). Here, the red dot represents a point in time where a decision was/is made. Also, the past was composed of several other ramifications such as this one, but here it can be represented as a straight line, considering that we would ignore all the choices I did not make. Again, if movement is always connected, new motions coming in from old in order fixed, if atoms never swerve and make beginning of motions that can break the bonds of fate and foil the infinite chain of cause and effect, what is the origin of this free will possessed by living creatures throughout the earth? Since we are indeed inserted in a physical world that responds to cause and effect, we must consider that we are too bound to this law. 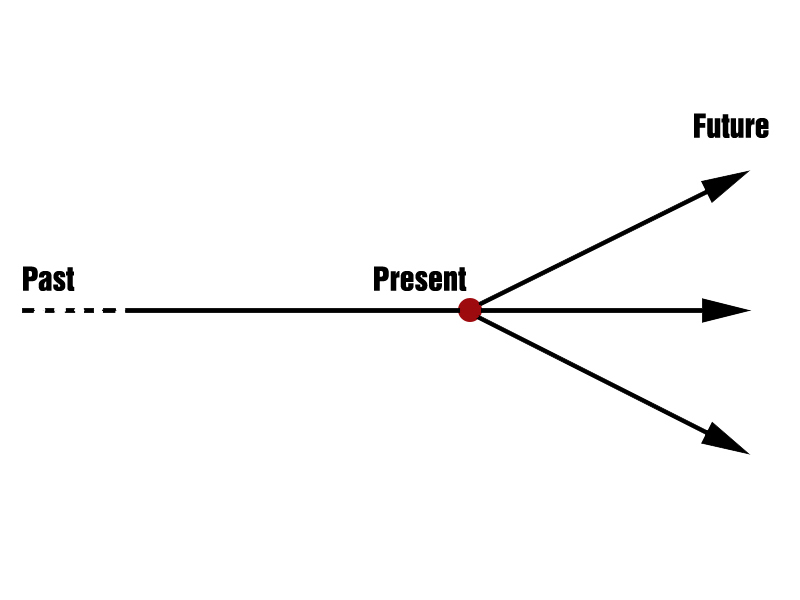 This makes it clear to me that determinism is very likely to 'be real' (as in be the 'thing' that really happens), since the past controls the present and the future, and we are not able to control the past, leaving us unable to control both present and future too (leaving us in control of nothing, basically). This would point toward incompatibilism, which I find easier to believe than its alternative. So, Blackburn spends most of the chapter trying to reconcile free will with determinism, introducing the concept of compatibilism. This is where I have some trouble, for I really cannot see how the two concepts are conciliated. The subject acted freely if she could have done otherwise in the right sense. This means that she would have done otherwise if she had chosen differently and, under the impact of other true and available thoughts or considerations, she would have chosen differently. True and available thoughts and considerations are those that represent her situation accurately, and are ones that she could reasonably be expected to have taken into account. In this possibility (reality?) there is no red dot, since I cannot see how decisions can actually be real. The thing is that Blackburn then goes on to explain some scenarios that always end up with a lot of could and would haves, and I cannot see them as plausible. The impression I get is that compatibilism is built upon a lot of could and would haves, which cannot be proven (or at least his arguments did not seem, to me, to be able to do it). Going back to my first example, I cannot see how the road I picked at the t-junction was ever my choice. Sure, my 'modules' are at work, analysing everything in the landscape, etc. so that I can make a decision. Sure it really seems to me that the results provided by such an analysis are the object of my own free will, but how can I ever really prove it, if in the basis of my thoughts I know that the physical world in which I (thus the modules) belong is bound by deterministic laws? What I mean is: upon analysis, I have the impression that I can choose where to go. In retrospective, I too am under the impression that I could have chosen differently. But how can I prove that I really could have chosen differently? Before I could (or thought I could) see how people could act according to their own free will, unrestrained by any type of determinism, although bound to the conditions 'available' to them (however, this seems to be bad philosophy). I now can see how we are bound to a deterministic physical world (ruled by the laws of cause and effect), where free will does not exist. But I cannot understand the middle term between the two views. How can our notion of free choice not be restrained by our physical world, and thus bound by the laws of causation? How can free will and free choice exist in such a world? Note: Whether this is actually an answer as opposed to an extended comment is debatable. I write it not as an answer (because I don't actually believe your question has an answer), but as "the closest one can get" to an answer. At any rate, I've turned it into a community wiki so I don't get reputation for it. The crossroad you have come to is common, and you should be proud you picked up on it: It's a telling sign that you actually understand determinism; a concept which — even after many students of philosophy graduate with their degrees — I can assure you many never fully grasp. You should note that there are dozens of different versions of compatibilism, each sometimes as radically different from each other as they are from hard determinism or libertarianism. I reckon some of the early versions were designed as a sort of "easing theory", published in philosophical journals as a "middle ground" to "ease" the academic community into this concept of determinism without seeming too radical. At any rate I have yet to read a convincing compatibilist argument myself, usually they just convolute terms like "freedom" and "determined" by redefining them in slightly different ways that supposedly don't conflict with (hard) determinism. Why do they do this? Because humans are not good at giving up things they are used to, or that they cherish. One of these things is the notion of moral responsibility, and determinism destroys this notion. Determinism also destroys the notion of praise (how can you praise someone for an action they took that was entirely inevitable, that wasn't of their own choosing?). This, in my opinion, is the real source of compatibilism: it is merely an unwillingness to accept that we may very well be automata, peering out the window of a robotic body, so to speak. I suggest you take a look at the SEP article on compatibilism and see if any arguments are convincing to you, and if not, no fear — simply cast them aside. I also recommend (one of my personal favorites) Daniel Dennet's Elbow Room. He claims to be a compatibilist himself, but his writing all but screams hard determinism. His work helped me formulate my own position, which I write briefly about in my answer to this question. Lastly, here's another question you might find interesting regarding choice. Therefore, we can view free will as being "compatible" with "hard" determinism. I too am under the impression that I could have chosen differently. But how can I prove that I really could have chosen differently? I think is not an objection to compatibilism, because the "if...then" statement remains perfectly true even if the antecedent is never met. Indeed, I think most people who call themselves compatibilists would argue that you cannot, in fact, have chosen differently, unless the circumstances were different. My view is that libertarian free will exists, by virtue of dualism (I believe this is a prerequisite). However, I could be convinced otherwise. For determinism, based on Wolpert's theory of maximum knowable information it appears impossible for us to prove determinism. Now, this doesn't shut the door completely on getting awfully close. For example, in the future we may be able to sufficiently simulate a real brain enough to answer this question generally to the satisfaction of most people by predicting outcomes, but somehow I think between Godel's limit of proving a system, Heisenberg's uncertainty principle, and Turing demonstration of the Halting problem is a way to show that determinism can not be proven. Since compatibilism rests fully on determinism (it is compatible with it, after all), that reasoning extends to compatibilism. I am finding compatibilism really to not be about free will anyway - as others have commented, it's really just a redefinition of terms to say that the free will is not really free - it is limited to certain choices. It then goes on to essentially say that we deterministically choose from among those limited choices. This is not a free will at all, from a perspective of being able to choose differently then I ultimately did. The only other alternative is libertarian free will, and this too cannot be proven. As it really requires dualism (or at least some separate level of existence or dimensions of reality, at least as I see it), it lies in a realm we have not figured out any way to test empirically to date. By the preceding I mean to imply that free will requires an actor outside of determinism - which would mean separate from the physical brain (although I do leave a small bit of room for the brain to create indeterminism on it's own at some quantum level or due to some physical law or dimension which exists that we don't understand yet). Applying determinism fully to a mind is a leap of faith made from our observation of apparent determinism within most physical processes and phenomena (although there are increasingly now counter-examples of those, such as quantum fluxuations). Following from the above logic, this cannot be proven. To go any further, I believe one needs to go beyond empiricism into the realm of meta-physics and/or theology, considering the problem of evil/suffering, body vs. soul, and free will vs. either determinism or providence (different sides of the same coin). I think this lands squarely in some form of dualism, at least as a means of further studying the implications of free will. For example - Augustine does not try to reconcile free will and grace/providence. He simply shows evidence that both must exist, without going into the how. This is an example from a Christian theological/apologetic perspective. Aristotle in his book, Metaphysics, stated that in his time all philosophers agreed that principles of things are contraries. In this view, one might suppose that the free-will of man and the determinism of nature is a contrary that is a principle. That the essence of spirit - freedom - is opposed to the essence of matter - neccesity. If one instead is a pragmatist, and so asserts both the determinism of physics and the freedom of the human will, then one can say that they are compatible but we simply do not understand nor describe precisely the mechanism of how this is the case. This sort of proof is reminiscent of an existence proof in mathematics where one asserts the existence of some mathematical object but it does not construct it, in some cases it is even shown that one cannot construct it. If we don't have free will, it implies we are constrained in some way or lacking some sort of ability. What is the thing we are missing, which if we had, we'd be free? There is no such thing. It's not even a superpower like teleportation or mind-reading which could hypothetically be true with enough technology/magic. It is literally a paradox. It seems pointless to lament something that is missing, if that missing thing could never have existed anyway. We are already as free and willful as any creature in any hypothetical universe could possibly be. Riding the waves of causality without feeling restricted is already the ultimate freedom. Another approach: Incompatibilism basically says "free will" involves some sort of "magical decision" which is both impossible to predict, and not random. Both compatibilists and incompatibilists agree that a magical decision which is impossible to predict and non-random is a paradox and can't exist. But the compatibilists ask, "what exactly is it about being impossible to predict that makes someone more free or willful than they would've anyway?" The mind-reading machine will predict which button I will press every single time, but I still pressed them based on my wants (will); I wasn't forced to press them. Not the answer you're looking for? Browse other questions tagged free-will compatibilism or ask your own question. What are some good introductions to philosophy? To what extent do we choose our beliefs? What is a mathematical description of free will? Can someone explain Compatibilism to me? Does compatibilism imply that a chess program has free will? Is there a consistent definition of free will? What is the difference between hard determinism and compatibilism, under the assumption of physicalism? Is there a term for the position “no determinism but no free will”? Why not obvious is how accepting determinism as true can or should affect our everyday conception of free will?